Narlyn Mosquera had a great game in the last round for top-ranked Sportiva Ita., receiving a Latinbasket.com Player of the Week award for round 9. The player had a double-double of 26 points and 19 rebounds, while her team edged out Univ.de Chile (#2, 7-3) 67-65. The game was between two of the league's top four teams. It allowed Sportiva Ita. to consolidate first place in the Chilean Liga Femenina. They maintain a perfect record without any lost game in the league. It's already very far into the season and Sportiva Ita. keeps a perfect 8-0 record. Mosquera turned to be Sportiva Ita. 's top player in her first season with the team. Narlyn Mosquera has solid league stats. She is in league's top in points (2nd best: 21.3ppg) and averages impressive 52.5% FGP. The second best player in last round's games was 38-year old former international forward Paola Naranjo (183-F-78) of Libertad SF. Naranjo had a very good evening with a double-double of 20 points and 14 rebounds. Of course she led Libertad SF to another comfortable win 87-68 over slightly higher-ranked Brisas (#5, 4-6) being unquestionably team leader. Libertad SF's 7th position in the standings has not changed. 8 lost games are too many comparing to just two victories Libertad SF managed to get this year. Naranjo is a newcomer at Libertad SF, but is already one of team's top players. Third on the list of top players last round was former international center Tatiana Gomez (192-C-81) of New Crusaders (#3). 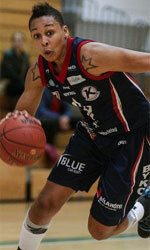 Gomez scored 28 points and grabbed sixteen rebounds (!!!). She was a key player of New Crusaders, leading her team to a 71-61 win against the lower-ranked Sergio Ceppi (#6, 3-7). New Crusaders needs these victories very badly if they think about getting closer to top teams. Their record at this point is 6 victories and 2 lost games. Gomez has a very solid season. In 3 games in Chile she scored 19.3ppg.